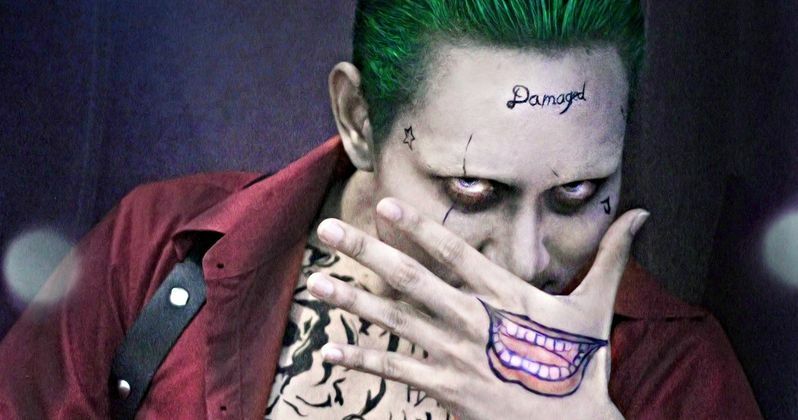 Suicide Squad featured a new look for the Joker, which included a bunch of crazy tattoos. Director David Ayer now says that he regrets putting the "Damaged" tattoo on the Clown Prince of Crime's forehead. While some DC fans champion Leto and Ayer's version of the villain, there are just as many who think that the creative team were trying too hard to make an updated Joker, which resulted in some pretty harsh reviews. To make matters worse, the villain was barely shown in the film after being featured heavily in the promotional material. David Ayer took some time out of his weekend to answer some fan questions on social media. One question was aimed directly at the Damaged tattoo on the Joker's face in Suicide Squad, asking where the inspiration came from and if it was Ayer's idea. Instead of answering the question directly, the director admitted that it wasn't his best idea and said, "Yes I have to fall on that sword. It was one step too far." Jared Leto's take on the Joker was a polarizing one and still sparks debate to this day, two years after Suicide Squad hit theaters. There really wasn't enough of the villain in the film to get a real sense of what David Ayer and Leto were going for, but fans may get the chance to see more of him if and when the Joker & Harley Quinn movie hits theaters. It was recently revealed that the script is complete and ready to roll, but it's unclear if the project will move past the writing stage at this point. Warner Bros. and DC Films are currently focusing their attention on Todd Phillips' new Joker movie, which stars Joaquin Phoenix as the titular villain this time around. David Ayer was asked about the upcoming film and simply said, "Todd and Joaquin are going to crush it." The first look at Phoenix as Joker in full makeup was released late last week, and as usual, the reactions have been mixed. However, Phoenix has promised that this isn't going to be a typical story about the Clown Prince of Crime, so some fans are unsure of what to make of this new direction at this time. Comparisons are already being made between Jared Leto and Joaquin Phoenix's style of the Joker, even though production just started for the Joker movie. People are either going to love it or hate it, and pit Phoenix up against Jack Nicholson, Heath Ledger, Caesar Romero, and Leto for years to come. And like David Ayer, Todd Phillips may have some regrets when all is said and done. Thankfully, there will not be any facial tattoos to explain when the movie hits theaters next year. You can check out some of the Suicide Squad director's comments on the new Joker movie as well as facial tattoos below, provided by David Ayer's Twitter account.